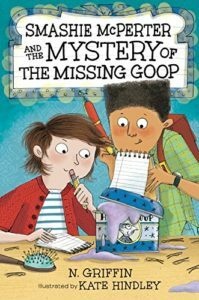 This entertaining mystery teaches a little about math, music, code breaking, and music. Kids will love solving the mystery along with the characters. Smashie and Dontel’s third grade class return to prepare for a musicale with the other third grade class. To spice up the show, they decide to sculpt everyone’s hair using a magical gel invented by Charlene’s mother. The hair goop (aka Herr Goop) allows Charlene and her mother to sculpt hair into any shape. Every time a new jar of Herr Goop shows up, it immediately disappears. Since the ingredients are expensive and the musicale is coming up soon, it’s important that the jars are found. Smashie and Dontel keep a notebook of clues, motives, and suspects to try to figure everything out. They notice a code written on the jars. After decoding, they follow the clues all the way to the musicale itself. The characters are lovable, the musical and dance numbers are engaging, and the intrigue is intense. Reading activities could include everything from 60s music to code breaking to baking brownies.